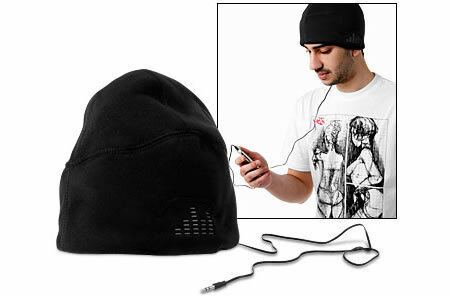 Keep Your Head Warm And Your Ears Full Of Tunes With iLogic Sound Hat | OhGizmo! By Jonathan Kimak on 10/24/08 • Leave a comment! It can be a pain trying to wear a beanie hat(or a toque if you’re a fellow Canadian) and headphones at the same time. Even earbuds can either fall out or get crunched too tightly into your ear. The iLogic Sound Hat solves the problem by putting the headphones into the hat. The Sound Hat’s headphones come with a standard 3.5mm jack that will work with the majority of mp3 players, cell phones and other devices. In addition, since the headphones are covered in the fabric it will have better sound suppression so that the person beside you is less likely to hear what you’re listening to. So don’t worry, your reputation will stay solid even if you are listening to the latest Celine Dion song. The hat sells for approximately $28 US.